When a person builds a new house or office, one of the accessories that he/she should put in place is a decorative wall clock. One thing that you should consider while choosing a wall clock is the uniqueness. A unique and a modern design wall clock in some way enhances the décor of your house or office. Need an acrylic round butterfly clock? Petcarl décor is the place where you can shop your favourite and modern acrylic wall clock. 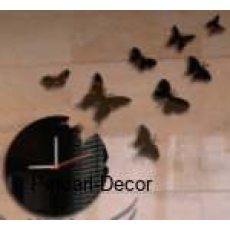 We sell acrylic black round wall clocks that come with other eight different sized butterflies that are stuck beside the main clock in a unique and decorative way. The best thing about a black wall clock is that, it can suit many different colors on wall. If you really love beauty and you would like to enhance the look of your house or office, do not hesitate to call us at anytime.